You can't do this alone, so you'll need some professional word safe crackers and gunmen writerly friends to help you suffer the worst of the blows. Teams differ depending on the size of the banook and the confidence of the mastermind. Having a big team is not necessarily a bad thing; having a small team won't do you any harm. The key here is simply to have a team and to love them. There's no we in team but you can spell mate and tame and etam; make of that what you will. After you smash through the door blank page you'll need to have some stock phrases to help keep the momentum afoot before the dust settles. This is to prevent cashiers pressing any shiny buttons allow for conversation with other people about your novel. Be careful what you say. Things like: "Hands in the air!" and "Where are my pants?" and "This isn't the post office!" are perfectly suitable at this early stage of the bank heist novel. Phrases like "I thought you were going to bring the explosives" and "The calories don't count if I read the tub backwards" are slightly less okay but we can also roll with those. The key to a good escape plan lies in having one. Imagine the scene, you've accidentally killed a hostage deleted a chapter and/or all of your notes on it, the fuzz crit partners are moments away and you haven't a moment to lose. If only you had that escape plan, that one idea you wrote down for later because you had no idea where it would go. If only it was a thing you might still have a chance of escaping the writerly blues job. Writing a novel is not simple. It's not like a bank heist. It'll never be as easy as that. You can't just shoot your locksmith in the leg for taking too long and then ditch him at the first hurdle. You don't get diamonds at the end of it. Nobody let's you play with a fancy explosive gadget, and if you keep telling people to stick their hands in the air they'll stop doing it after maybe five or six goes. 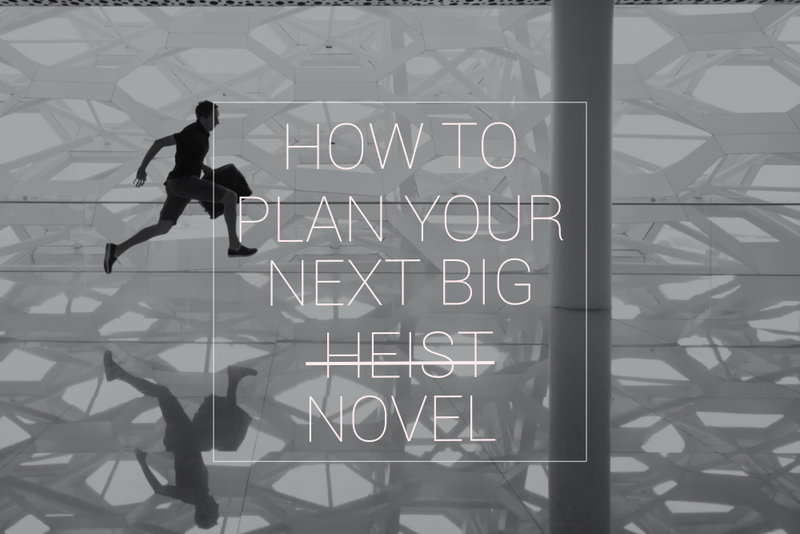 Writing a novel is not like a bank heist. It's rewarding, and you'll never be stuck in a corner without options if you lead with your words. You don't have to take hostages to be heard, and it's not completely illegal. Best of all, you get to go on the greatest adventure you can dream up. Best of all you get to write a book. Who doesn't want to do that?